iOS 7 is set for public release on the 18th, making now a good time to start preparing for the major iOS update on any iPhone, iPad, and iPod touch. But before jumping ahead with the 7.0 upgrade, you should check on compatibility and do some simple cleanup and backups with your iOS devices… so here are seven steps to prepare for iOS 7 the right way. A quick word of caution… just because older iPhone and iPad models are on that list does not mean they should be updated. This is somewhat controversial advice, but based upon plenty of experience with major iOS updates, the older models may want to avoid the update entirely – at least until a point release (say, 7.0.1 or 7.1) comes later to potentially resolve some inevitable speed and performance issues. This may or may not apply to iOS 7, but it’s something to take into consideration. Many people are running iOS 7 beta software (officially and unofficially), and many of those users are also unaware that these betas have an expiration date. When the device expires, it basically becomes useless and must be downgraded or updated to a newer version to be usable again. Don’t get caught with a temporarily bricked device, take the time to leave the beta and downgrade back to iOS 6 while you can, or update to the final GM build. You won’t find the iOS 7 GM as an over-the-air update from the beta releases, thus developers need to use the dev center to download the GM, which can be done build right now. Note that users on iOS 6 will find the iOS 7 release as an Over-the-Air update starting on September 18. It’s certainly not necessary, but it’s always a good idea to do some app cleanup between major iOS updates. There isn’t much to this, just poke around your iPhone, iPad, or iPod touch and look for apps you don’t use often, or don’t need, then delete them. There is no harm in deleting apps because you can always download them again later without having to pay for them again, they are all stored in the “Purchased” section of your Apple ID account history and accessible through the App Store. Done together, you can often free up anywhere from 500MB to as much as 5GB of space. Not bad for a few minutes work, huh? Many of us rely on our iPhones (or even iPads) as our primary camera these days, which means they are full of memories and moments that you don’t want to lose. But iCloud’s Photo Stream is still misunderstood by many people and won’t keep all your pictures anyway, so the best thing to do is to periodically copy them all over from the iPhone, iPad, or iPod to a computer. Whether you have a Mac or Windows PC, transferring them from iOS to a computer is easy. An alternative that doesn’t require a computer at all is to back them up to a service like DropBox or another third party cloud storage provider. We recommend the dual backup approach because it’s pretty much foolproof, leaving you with both local iTunes based and iCloud based options if you need to restore the device for whatever reason. Backing up is easy as always and the same across any iPhone, iPad, or iPod touch. Always back up your devices before installing any system update. This is particularly important for major iOS updates like iOS 7. 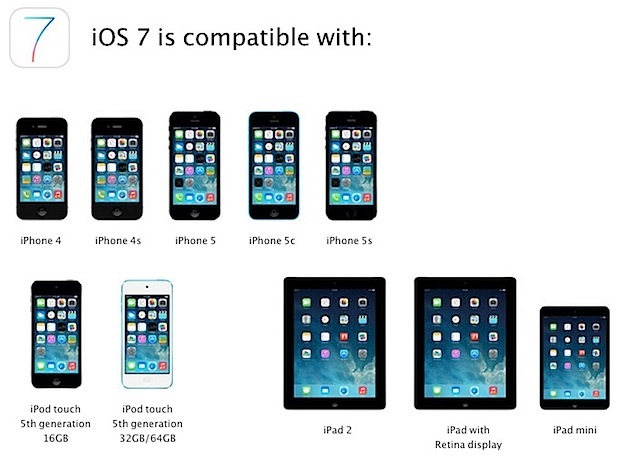 You’re ready to go with iOS 7! Installation and upgrading will be simple through OTA as usual, widely available on the 18th in just a few short days. On the other hand, if you’re a developer you can get the GM now from Apple, and the unusually impatient can take another route with a clean install right now too – but it’s really not recommended. Whatever you do, enjoy iOS 7, it’s a pretty great update!